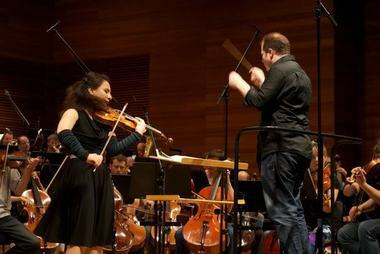 Violinist Catherine Manoukian has been praised for her innate musicality and imaginative artistry on orchestral, chamber music and recital stages. Her career began at age 12, with her orchestral debut with the Vancouver Symphony and, since then, her unique interest in both philosophy and music has led to a thoughtful professional path filled with international engagements and numerous recording projects.! Ms. Manoukian’s impressive list of accomplishments include guest performances with many major North American and international orchestras, such as the Toronto Symphony, the Boston Pops, the Calgary and Fresno Philharmonics, the Manitoba Chamber and CBC Radio Orchestras as well as the Tokyo Philharmonic, Osaka Century Orchestra, the Armenian Philharmonic, the Helsingborg Symphony, the Norrköping Symphony, and the Turku Philharmonic Orchestra. As a recitalist, she has appeared on major stages in New York, Washington D.C., Boston, Los Angeles, Toronto, Paris, Tokyo and Osaka and as a chamber musician at the Aspen, Caramoor, and Newport International festivals. She has collaborated with such esteemed conductors as Mario Bernardi, Jukka-Pekka Saraste, Keith Lockhart, Roy Goodman, Peter Oundjian, Antonello Manacorda, Theodore Kuchar, and Stefan Solyom.! With an affinity for recording and an inestimable curiosity for the violin repertoire, Catherine Manoukian maintains an extensive discography. Her early records were on the Marquis Classics and the JVC Victor labels: Elegies and Rhapsodies (1998), a debut recital collection, Chopin on Violin (1999), consisting of transcriptions for violin of works by Chopin, Lyricism (2002), a collection of encores, and Catherine Manoukian, Violin (2006), featuring the Shostakovich A minor and Khatchaturian Violin Concertos, recorded with the Armenian Philharmonic under Eduard Topchjan, and a pairing of the Franck and Strauss E-flat major sonatas, with pianist Xiayin Wang (2010). Her more recent releases, on Berlin Classics, include a live performance of the Elgar Violin Concerto, with the Staatskapelle Weimar and Stefan Solyom (2013), and the Brahms Sonatas with Gunilla Sussmann (2014). She recently recorded the Brahms Violin and Double Concertos with the Helsingborg Symphony and with cellist Jakob Koranyi, with an anticipated release date of early 2016. Highlights of the 2015-2016 season include reengagements in Weimar and Bayreuth, among others, as well as debuts at the Nevada Chamber Music Festival, with the Duisburg Symphony, at the Cologne Philharmonie, and in Bratislava.! Ms. Manoukian’s intense inquisitiveness extends far beyond the violin. She holds multiple degrees, including undergraduate and postgraduate degrees in history and philosophy from the University of Toronto and her doctoral research, funded by the Social Sciences and Humanities Research Council of Canada, explored the nature of rationality, from the dual perspectives of philosophy and neuroscience. A secondary interest in philosophical aesthetics created the bridge between these academic ventures and Catherine's musical career.! Catherine Manoukian began violin studies with her father, and made her first stage appearance at the age of four. From 1994 to 2000, Catherine studied with the late violin pedagogue Dorothy DeLay in New York City.